We provide, concrete pumps, laser screeds, and finishers to pours. But our true service comes in how we are a partner in your pour. With our knowledge, we are often able to save contractors thousands of dollars by utilizing our experiences to more effectively and efficiently place material. 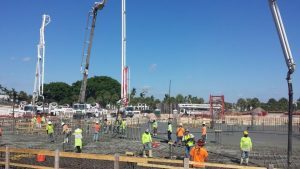 We have pumped over 1.3 million yards of concrete in the past five years alone, performing on projects of every kind, and caliber of difficulty. If you have a shell contract, and need a trusted consummate professional to consult and pour with please do not hesitate to call us at 772-220-3435.